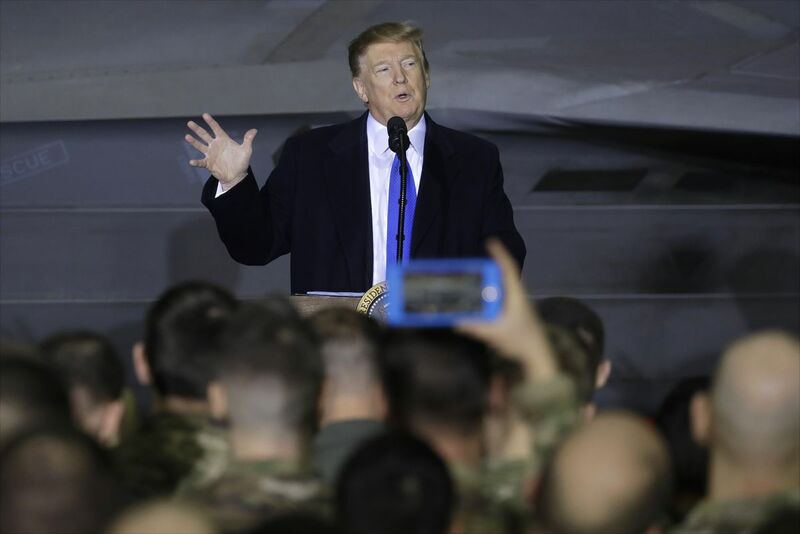 JOINT BASE ELMENDORF-RICHARDSON — President Donald Trump showered praised on troops and touted the opening of the Arctic National Wildlife Refuge to oil drilling when Air Force One made a refueling stop Thursday in Alaska as the president returned from Asia. He didn't discuss those talks during a 20-minute address. He noted that since World War II, Alaska-based forces have served as the top cover for North America. 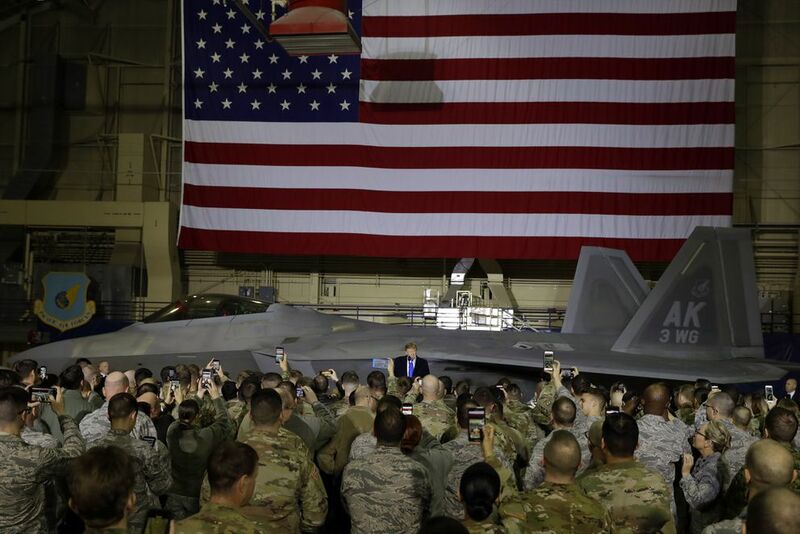 More than 100 JBER personnel listened to President Donald Trump speak during his visit at Hangar 1, Feb. 28, 2019. 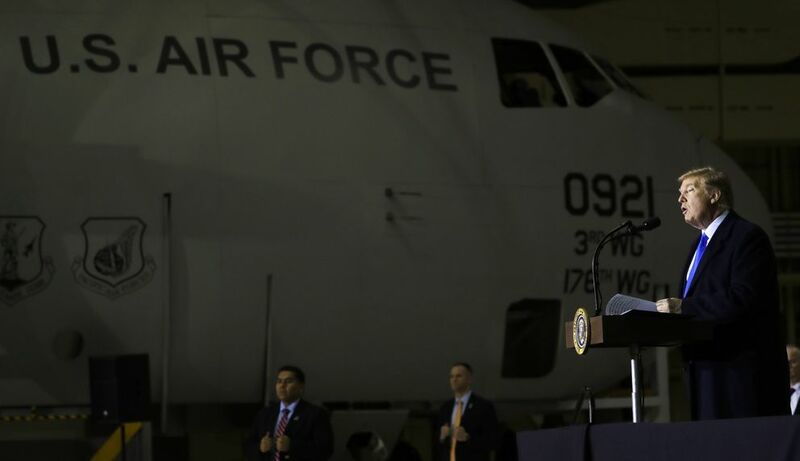 The president was at the base to meet with service members after returning from his summit in Hanoi, Vietnam. Trump also noted that the Anchorage base will receive the first of 54 new F-35 stealth fighter jets that will be “arriving here very soon.” He also said 20 more ground based interceptors will be installed at Fort Greeley, about 100 miles south of Fairbanks, to strengthen the nation’s missile defense system. Trump said he’s always had a special place in his heart for Alaska, which could stem from a grandfather who ventured north to look for gold. The president said his grandfather didn't find gold but opened hotels for others who also traveled north to seek their fortunes. Trump touted legislation to open the coastal plain of the Arctic National Wildlife Refuge to oil exploration, an effort finalized after decades of fierce disputes between Republicans and Democrats. The Trump administration and congressional Republicans said the drilling plan would help pay for tax cuts approved by Congress and signed by Trump in December 2017. GOP lawmakers project at least $1 billion in revenue from drilling leases over 10 years. But environmental groups and other critics call those projections wildly optimistic, saying low global oil prices and high exploration costs are likely to limit drilling revenue. Protests have marked recent public hearings on the plan in Fairbanks and Anchorage. The administration plan calls for at least two major lease sales, each on a minimum of 625 square miles in the refuge’s coastal plain. Surface development would be limited to 3 square miles. Trump praised Alaska’s new governor, Republican Mike Dunleavy, who flew in for Trump’s JBER visit. “He said, ‘We really appreciate you got that done,’” Trump said of the conversation he had with Dunleavy about ANWR. “He’s not only one of the best governors in the United States, he’s definitely the largest,” Trump said of Dunleavy, who stands 6-foot-7. Trump told Dunleavy he could call him any time he has a problem, "and we'll take care of it for Alaska." Dunleavy, who met with Trump on Air Force One, said Alaska has a "remarkable friend and advocate" in the president. "He clearly recognizes our geographic value and the strategic role Alaska serves in the defense of our nation," Dunleavy said in a statement. 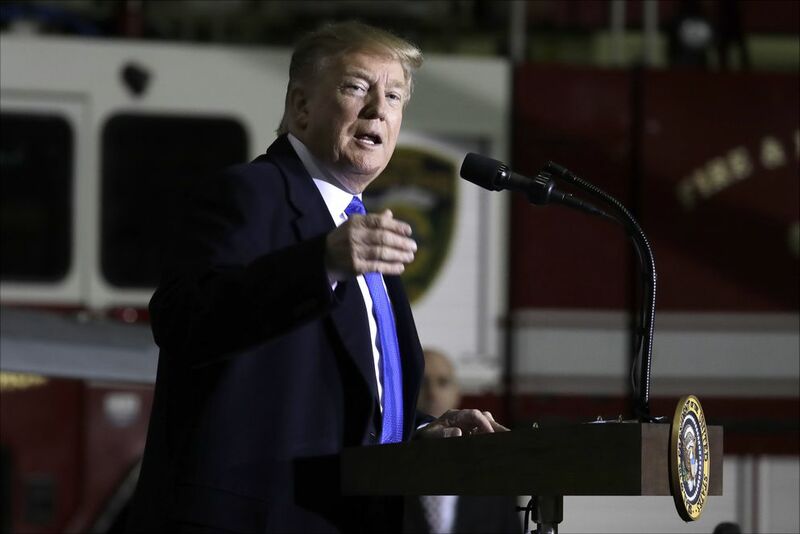 "From issues like ANWR to his immediate help with the Nov. 30 earthquake, the president has made it clear that Alaskans and Alaska's success is a top priority," he said. The president endorsed Dunleavy in last year’s election, in which Dunleavy defeated former Democratic U.S. Sen. Mark Begich after independent Gov. Bill Walker dropped out of the race just weeks before Election Day.